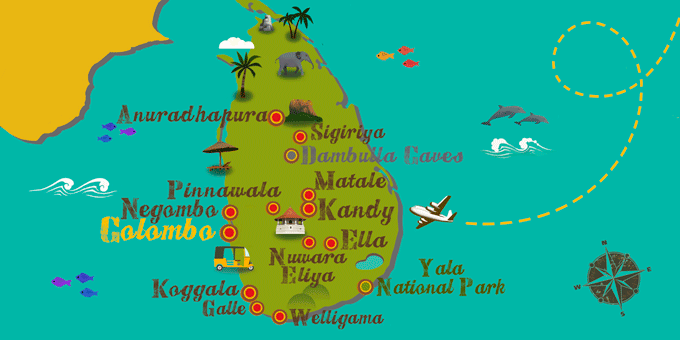 Sri Lanka is a country taken straight from an adventure story. In the ancient Ceylon, the elephant is revered, as the animal is associated with divine grace. Because of this, many Stupas, the constructions which guard the relics of Buddha and other saints, boast a belt of elephants carved from stone, standing guard around them. There are a great many examples of these in the northern part of the country, where the ruins stick out from the splendid vegetation. In the heights of the central region, tea is grown in homesteadings which seem to be straight out of the colonial era. A little further on, in the ochre temples of Kandy, the precious Buddha's tooth is closely guarded, brought out once a year during the Esala Perahera procession. Visit the south of Sri Lanka and see the wild animals that run free in the Yala Reserve and the fishermen who perch with their poles, not moving for hours as they wait to feel the tug on their line. In short, a collection of unforgettable emotions and images, which many travelers combine with another destination, such as the Maldives. Passport with a minimum of six months validity and a return ticket. One passport page. There are no mandatory vaccinations for travelers from U.S. states. People drive on the left-hand side of the road. Moving the head from side to side means yes.